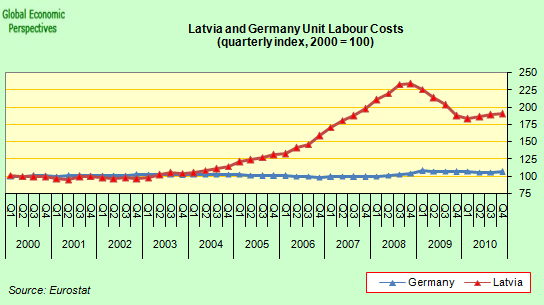 Next To QE3 Or Not To QE3, That Is The QuestionPrevious Is Italy, Not Spain, the Real Elephant in the Euro Room? Now talk of some sort of ultimate inferno here may strike a pretty discordant note with many readers, since most of the economic chatter of recent days has centred on how the BELLS constitute a positive example, not to mention a most attractive alternative to all those dreadful sounding PIGS. 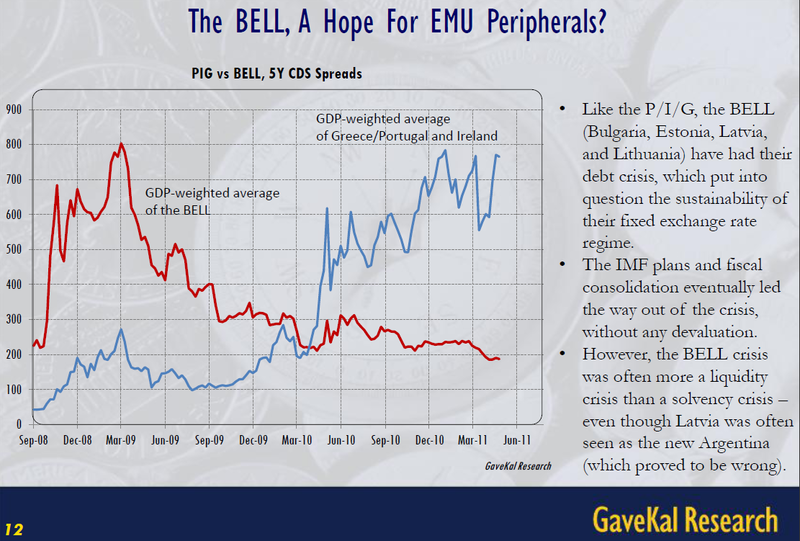 According to GaveKal’s François-Xavier Chauchat, for example, the BELLS should be seen as a ray of “Hope For EMU Peripherals”, since just like the PIGS the BELLS have also had their own debt crisis, one which was so severe at the time that it put into question the very sustainability of their fixed exchange rate regimes. 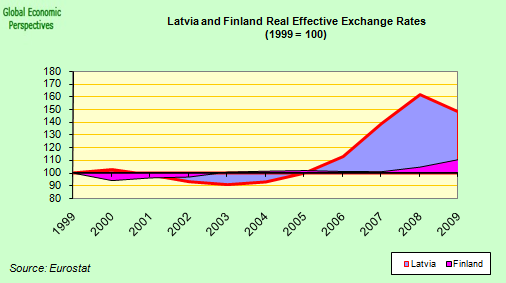 However, in these most fortunate of cases, the bad times are now well and truly behind us since a happy combination of IMF programmes and fiscal consolidation (coupled in Estonia’s case with subsequent admission into the Euro group) eventually led them out of crisis, and without the need for any sort of sordid devaluation to boot. And then, as they say in Spanish “fueron felices y comieron perdices” (or to put it the English way, “they all lived happily ever after”). Or did they? 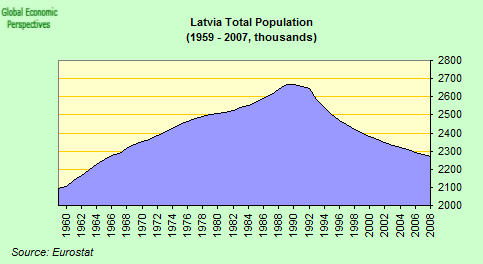 Well, on Chauchat’s view, the BELL crisis was always more of a liquidity than a solvency one (see chart below) – and this despite the fact, which he notes, that Latvia was very often argued to be a modern equivalent of the Argentina of the late 1990s (an assertion which, he says, has ultimately proved to be wrong, although in fact on this particular solvency vs liquidity argument, the true test will be the ability of Latvia to pay back the 7.5 billion euro EU/IMF bailout loan, in full and on time, and especially the very onerous 2014/15 installments). 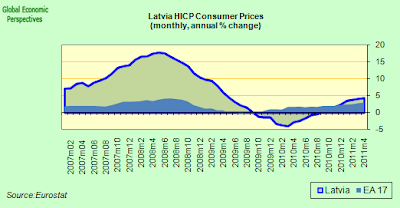 From a macroeconomic perspective, however, the big issue was always one of just how the hell these countries were going to dig themselves out of the hole they had dug themselves into, and do so at the same time as staying on the peg. The view that the BELLS have somehow proved the monstrous regiment of professional macroeconomists totally wrong is now quite widespread (for a balanced and more nuanced version of the argument see this post by my fellow RGE Economonitor blogger Ed Dolan) , and indeed such sentiment may well form part of a much more general dispute between micro- and macroeconomists about how to find solutions to the present crisis. 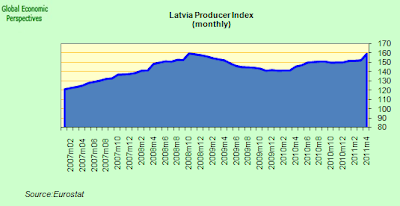 Only last week the Latvian Prime Minister Valdis Dombrovskis presented a book in Riga which he has co-authored with Anders Åslund of the Peterson Institute which has the rather assertive title: How Latvia Came through the Financial Crisis. 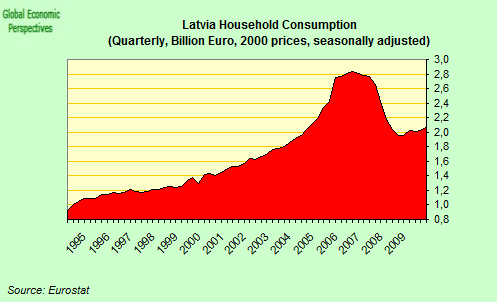 The associated press release proudly states that a key lesson to be learnt from the resolution of Latvia’s financial crisis is that “devaluation is neither the panacea nor the necessity that many economists make it out to be”. 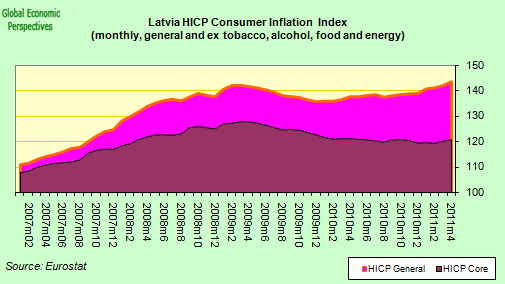 “Finally, the international macroeconomic discussion was not useful but even harmful. Whenever a crisis erupts anywhere in the world, a choir of famous international economists proclaim that it is “exactly” like some other recent crisis—the worse the crisis, the more popular the parallel. Soon, prominent economists led by New York Times columnist Paul Krugman claimed that “Latvia is the new Argentina.” A fundamental problem is their reliance on a brief list of “stylized facts,” never bothering to find out the facts”. The funny thing is that, far from having learnt from the error of my ways, I still consider the original IMF decision to have been a mistake, although I would point out that I personally never suggested Latvia was like Argentina (another thing is to say that much of what is going on along Europe’s periphery of late carries with it a distinct sense of Argentina deja vu), since I actually think that Argentina is an example of what not to do and that if you are looking for historical precedent for what should be going on in Latvia (read the BELLS) Turkey would be a much better role model. I also think that one of the conclusions we will eventually be able to draw from this whole sorry affair is that those who specialism is not macroeconomics would do better dedicating more of their precious time to trying to understand what we are saying rather than engaging in ill-informed ideological polemic. 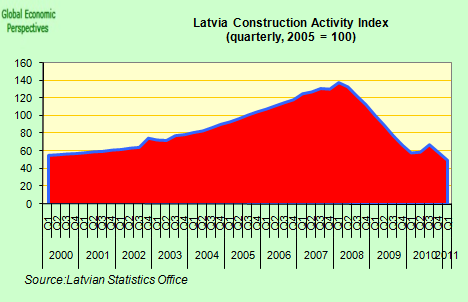 And I say this since I believe that the Latvians themselves deserve better. They may well not be able to avoid serving as guinea pigs, enabling macro- and microeconomists to see just who is right, but they surely don’t merit being converted into yet another ideological football. Didn’t we have enough of that during the Soviet years! Growth started to return to these economies in the second half of 2010, but with capital inflows now well below pre-crisis levels they have now entered a lengthy and difficult adjustment process. With domestic demand well below earlier highs and still struggling, exports have now become the prime mover of economic growth. Since the recovery in external demand has produced a rapid return to earlier export peaks the impression of a return to earlier economic dynamism has been created. I think this interpretation of the recent strong export growth is misleading, since it is one thing to recover lost ground, and quite another to attract the FDI needed to seriously expand capacity and keep increasing exports beyond their pre crisis peak. Strong year-on-year increases in exports have moved headline GDP numbers forward, but as 2011 continues annual export growth rates will drop substantially, and may even get stuck at a snail’s pace, meaning that the respective economies will be struggling to find growth, create jobs, and maintain the servicing of their external debt. 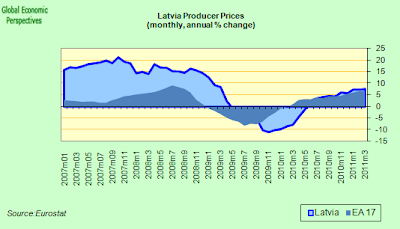 In my opinion, and despite some early encouraging signs, it is far from self-evident that the so called “BELLS” (Bulgaria, Estonia, Latvia and Lithuania) are going to be able to export their way out of trouble in the way they need to (given the collapse of internal demand) with the current relative price structure. It is my considered opinion that the “internal devaluation” process may have been underambitious and allowed to come to a halt far too soon. And indeed, if we get to the point, this is why so much of the conventional macroeconomic wisdom and advice leans towards open devaluation, simply because it is hard to maintain the political consensus for long enough to carry out a deep and painful deflation adjustment, and indeed this is the lesson drawn from the 1930s that I was brought up on. “Strong policy actions under the SBA have helped restore confidence, contributed to economic recovery, and enabled significant progress toward Latvia’s goal of euro adoption. The government has continued to achieve substantial fiscal savings while also protecting the poorest through social safety net spending and a temporary public works jobs program, and is strengthening its active labor market policy efforts. Looking ahead, the government has committed to meet the Maastricht criteria for euro adoption and strengthen the financial sector, which should further enhance confidence and support a rebound in growth”. The main advantage of widening the bands is that it should eventually deliver a faster economic recovery. Although growth would be depressed in the short run by balance sheet effects, the economy might then bounce back more sharply, and a Vshaped recovery would likely start in 2010. 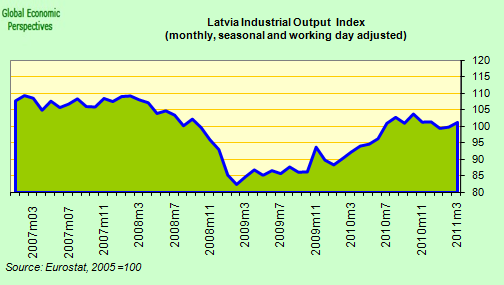 This reflects a faster improvement in competitiveness since high pass-through (reflecting Latvia’s openness to trade and liberalized movement of labor within the European Union) would be dampened by the negative output gap. 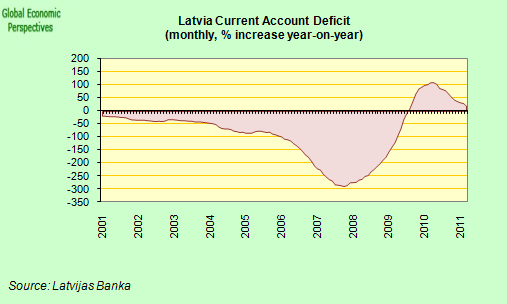 Enhanced competitiveness would also reduce the current account deficit more quickly. This would come mainly from import compression, with a relatively slow response of Latvia’s underdeveloped export sector, especially as the external environment is not as supportive as in previous devaluation-induced recoveries as Argentina, Russia or East Asia. 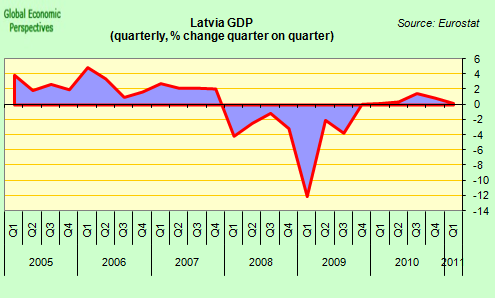 Latvia = Limbo, Greece = Hell, yes, I can go along with that. Not being a theologian, I had to appeal to that greatest of authorities, Wikipedia, to brush up on Limbo. It seems to be a place you go if you die in a state of original sin, but from which, unlike hell, there is some hope of escape. Let's hope so. 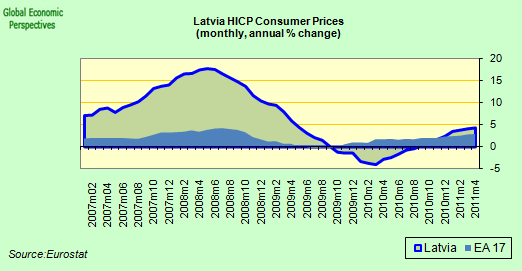 Tje original sin, as I tell my Latvian students, was the decision to hold to the rigid currency peg at the moment of EU accession. 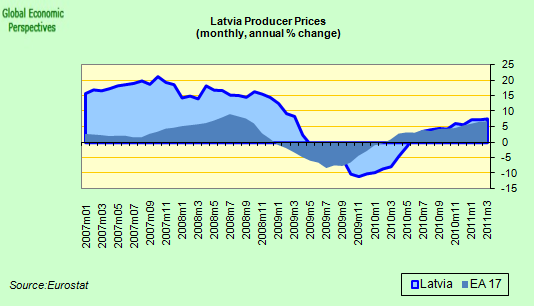 Remember, at the moment of EU entry, Latvia had a fixed exchange rate, but a rather unusual one. 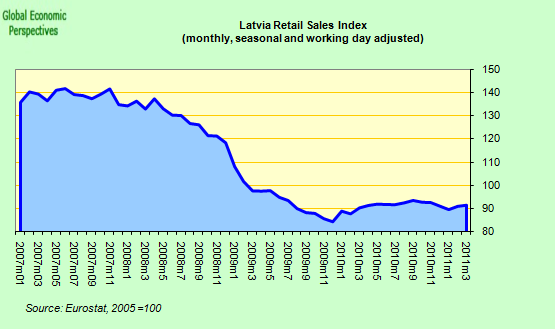 Unlike Estonia, Lithuania,and Bulgaria, Latvia did not have a true currency board, but instead, a peg to a currency basket with a + or – 1% band. Starting from that, it would have been legally, administratively, and politically feasible, at the moment of switching to the all-euro peg, to broaden the band (all at once or gradually) to the 15% maximum allowed by the ERM. 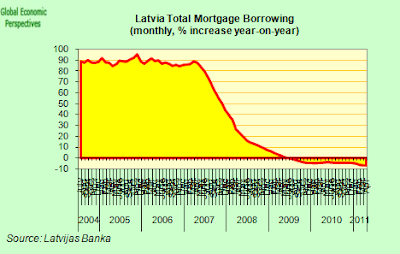 The lats would have run up to the strong side of the band during the boom, and plunged to the bottom in the crash, a full 30% swing, about the same as the Czech Republic or Poland, which have come much closer to something like a V-shaped recovery. The other part of the original sin was to think that an (approximately) balanced budget was sufficient fiscal virtue during the hump of the GDP boom (and it was a big hump, as vividly shown in the graph earlier in this post). 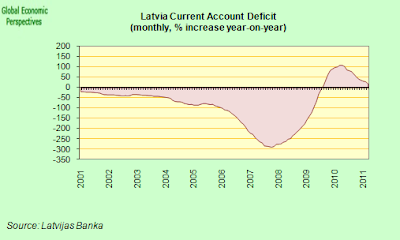 Instead, the government should have had a big surplus accumulating into a stabilization fund, to be run down during the crisis, as was done next door in Russia. But all that is water under the bridge, too late to go back and undo it now. Hugh's post is a very good summary of the obstacles ahead. I hope he is wrong that premature exit from the internal devaluation has thrown away all the promised gain from the pain of internal devaluation. Thanks for the interesting comment. I think your description of limbo just about fits, you can escape upwards, but if you don't you will inevitably fall even deeper down. I absolutely agree about the bands (and that in fact Poland and the Czech Republic made the best decisions), and I think the IMF should have stood their ground at the end of 2008 and insisted on devaluation and Euro entry. The idea that this was against Maastricht is just a hoot – look at how many things which were against Maastricht we are now doing (normally on a too little too late basis). 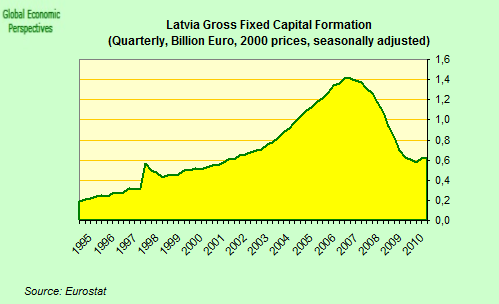 The big issue is that on the institutional (EU/IMF) level there has been no self criticism, yet it is clear that institutional and policy deficiencies made what happened in the Baltics possible, and now no one really wants to accept responsibility. Naturally, there should have been a much stronger fiscal surplus, and the IMF were prodding for this, but not strongly enough, and Econfin and the ECB, they were simply obsessed with the Maastricht criteria until it was far too late. So what happens now? Well, they will either press on with the internal devaluation (which seems unlikely, since everyone except you and me and Neil Shearing (andof course PK) is now cheering it as absolute success, or they will be stuck in Limbo till they can't be stuck anymore, then something will happen. One point I would draw attention to about all these four countries is the absolutely dire demographic situation. It seems almost no institutional or academic economist is modelling with this as an issue, and of course it is going to be a big one. Just another issue that the founding fathers of neo classical economics failed to forsee. 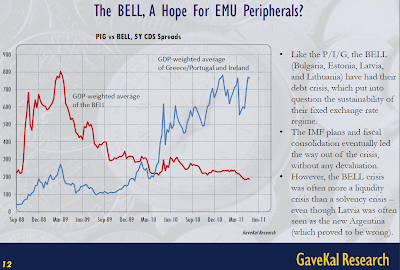 "I vividly recall discussions with euro-zone authorities in 2007 — when I was chief economist at the I.M.F. — in which they argued that current-account imbalances within the euro zone had no meaning and were not the business of the I.M.F." Here in Europe I felt like a lone voice in the wilderness trying to say that these internal Eurozone capital movements were deeply significant, and now we are destined to face the consequnces. I think Europe's leadership are still in massive denial on what all this really means. @edward: thanks very much for this interesting post. 1. I fully agree that Eurozone policymakers have underestimated the risks associated with massive capital flows in an integrated currency area and with ever closer cross-border linkages between banks. To use Martin Wolf's expression: A gold standard on financial steroids. However, they implicitly admitted that they have not paid sufficient attention to the problem by introducing the excessive imbalances procedure, which is supposed to monitor these developments more intensely from now on. By the way concerning the IMF, it was my sense that the Eurozone countries prefered to discuss these things internally and thus tried to keep it more or less away from the global stage. 2. By reading your post, I thought maybe the issue is not so much an exchange rate question, but rather one of debt restructuring vs. non-debt restructuring. A key constraint to the current recovery is the high level of debt. Now, a nominal devaluation would likely have led to many defaults, apart from improving competitiveness. Now, wage and price deflation have achieved the improvement in competitiveness (maybe not enough), but without widespread defaults. Just a thought. 3. 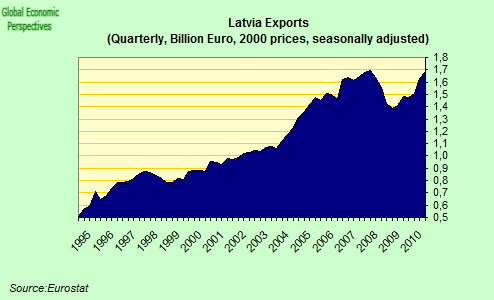 I wonder if you're not a bit too pessimistic about export growth prospects. But we will see how it turns out. 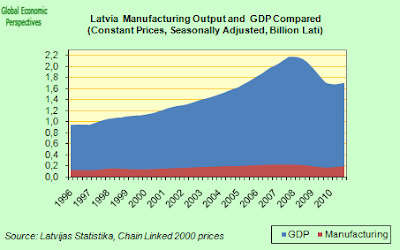 "Now, a nominal devaluation would likely have led to many defaults, apart from improving competitiveness. Now, wage and price deflation have achieved the improvement in competitiveness (maybe not enough), but without widespread defaults". 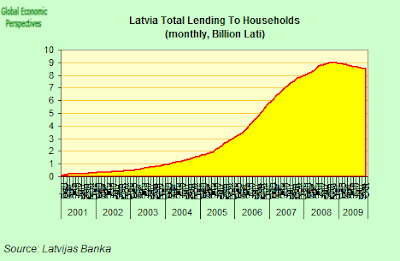 But this is just the point, my feeling is that the internal devaluation hasn't really been very deep due to the realisation that if it was loan defaults would follow, and the banks have been kept on board via a Baltic Version of the "Vienna Accord" whereby they maintain funding to let the local offices continue to lend and extend in the hope values improve later. "We can’t devalue, they say, because the Latvian private sector has a lot of debts in euros, and a devaluation would make it very hard for borrowers to service those debts. As Hugh points out, the proposed alternative — sharp wage cuts, and basically a major domestic deflation — will also make it hard to service those debts. 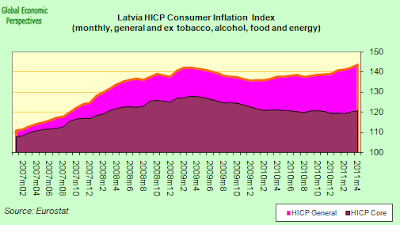 In fact, I’d be a bit more specific than Hugh: other things equal, a nominal devaluation and a real depreciation achieved through deflation should have exactly the same effect on debt service (unless some of the debt is in lats rather than euros, in which case devaluation would do less damage.)" So excuse me if I have the feeling that the idea of a real internal devaluation, instead of a cut in public sector spending and wages was never on the agenda. On where or not exports are going to grow long enough and fast enough, you need to get to grips with what the idea of "export dependence" means in an overindebted and rapidly ageing society where the population is also shrinking quite fast (in historical terms). 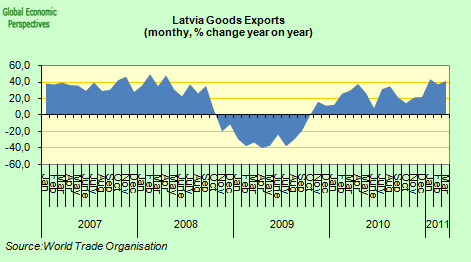 I mean, the Latvian economy SLOWED in the first quarter, while exports everywhere were booming. That I think is the smoking gun. thank's for the answer. I don't disagree with your analysis, you know the data much better than I do. 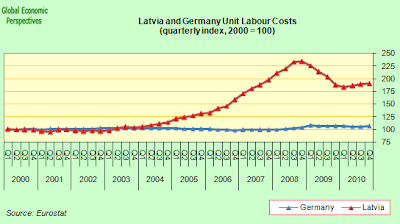 Q1 export performance in light of strong growth in Germany and other countrie is really something to worry about. 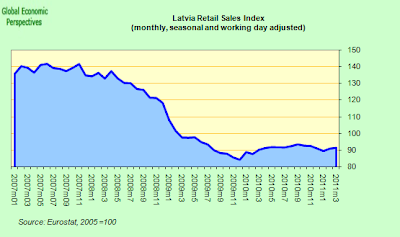 I just hope you're wrong, because if not, the future does not look rosy for Latvia.